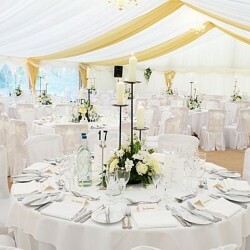 Tent Drapings for all occasions available to order. 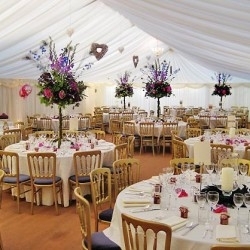 Create a beautiful setting with our large range of drapes for all marquees, tents and events. Tents Manufacturer draping fabric is made with the highest quality fabric. We have a wide range of colours to choose from and in fabrics that suit your event. 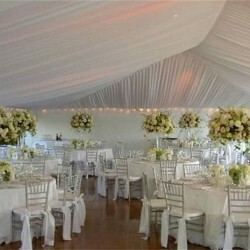 Tent draping for sale and decor material is used to embellish the look and feel of any type of function or event. 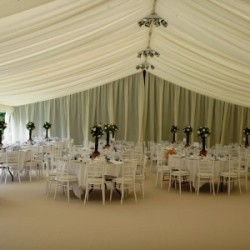 Take any sized tent or marquee and turn it into a beautiful affair with our excellent fabrics and draping material. Our tent drapes can be used at weddings, parties, conferences and much more…Deck out your special occasion with our high-quality tent draping at exquisite prices. Our tent drapes are practical, and affordable for all types of functions from private to corporate dos. You can also view our range of table cloths and chair covers to match your event theme and type. Draping Material Manufacturer specializes in the manufacture of tents, marquee, table and chair. We are committed to manufacturing excellent quality tents and marquees at the most competitive prices. Our low prices do not mean that we compromise on quality, all marquees and tents are manufactured to the top standard.The company has a top proficiency in the manufacturing of tents, marquee, table and chair. We have a professional team to offer the top of quality and service. The company takes pleasure in introduce itself as one the biggest Tent Manufacturer, Tent Supplier, Tents Exporter, Tents Wholesaler from Durban South Africa. Draping Material Manufacturer is supplier and wholesaler of tents and marquees in South Africa. we manufacture tents like peg and pole tents, marquees, frame tents, aluminum tents, canvas tents, frame tents, aluminum tents, disaster tents, relief tents, refugee tents, military tents, army tents, Bedouin tents, function tents, wedding tents, party tents, exhibition tents, army tents, luxury tents, events tents, exhibition tents, storage tents, warehouse tents, peg and pole tents, alpine tents, emergency shelter tents, Bedouin tents, pagoda tents, plastic chairs, Tiffany chairs, tables, portable toilets and mobile chillers in countries like South Africa, Mozambique, Angola, Swaziland, Kenya, Botswana, Zambia, Zimbabwe, Namibia, Nigeria & Lesotho. © Copyright 24-04-2019 02:53:18 by Tents Manufacturer. All Rights Reserved.